This item works well when used with any Manufacturer's Pedestal or Surface Mount Box. Provides temporary or permanent metering of electrical power at 50 ampere RV sites. Can also be used for checking accuracy of existing older meters. 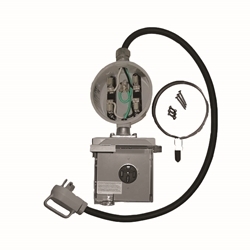 Kit comes pre-wired with 50 amp cord to meter socket and lockable 3R weatherproof receptacle. Includes meter ring, meter seal, mounting hardware and instructions.